Within New England, the most obvious choice for Amazon to build its next headquarters is either somewhere in Boston or just outside it. Right? Don’t tell that to the growing number of starry-eyed local officials and developers elsewhere in the region who are drawing up pitches of their own to try to lure the e-commerce giant, including those in cities and towns much smaller and with considerably less to offer than Boston and the dozens of other major cities around North America said to be in on the hunt. Officials in dozens of communities regionwide have said publicly they are considering bidding or plan to submit a proposal either on their own or as a multicommunity group and in some cases in conjunction with state officials, according to Globe reporting and a review of coverage from other news outlets. Maybe they’re delusional, or perhaps they’re on to something and can deliver the exact kind of outside-the-box bid that visionary Jeff Bezos and company are seeking. After all, Amazon has said it wants communities to “think big and creatively” when proposing locations. Remember, this is a company that’s hoping to someday deliver packages to customers’ doorsteps via armies of drones. St. Mary’s Center provides housing and job training to homeless families. And what the underdog communities might lack in size and amenities, they, in some cases, make up for with confidence. Take Dean Mazzarella. He’s the mayor of Leominster, a 41,000-resident city in north-central Massachusetts that plans to submit a dark-horse entry to serve as the home for Amazon’s future headquarters, which will employ as many as 50,000 workers. Curious about what other places plan to bid before next week’s deadline? Check out the map below and click the star symbols for more information about communities that might enter the sweepstakes for Amazon’s second headquarters. You can also scroll through the list below the map to see the details. ■ The City of Boston is expected to bid with multiple sites and is seen as a strong contender on the national stage. ■ The soon-to-close, 161-acre Suffolk Downs horse track property in East Boston and Revere, located alongside two Blue Line stops, has emerged as a leading site among city officials. ■ The city is also considering sites closer to the core of the city, such as Widett Circle in South Boston, Beacon Yards in Allston, and maybe a cluster of properties in and around South Station. ■ Meanwhile, developers are pitching their own ideas, ranging from parking lots on the edges of the Seaport to downtown office towers. ■ Neighboring Somerville is also pushing for a regional bid that would string Amazon buildings along the Orange Line from Assembly Row in Somerville, to Sullivan Square in Charlestown, to the mixed-use NorthPoint campus in Cambridge, to a planned office building at North Station. For more info, click here, here, here, and here. 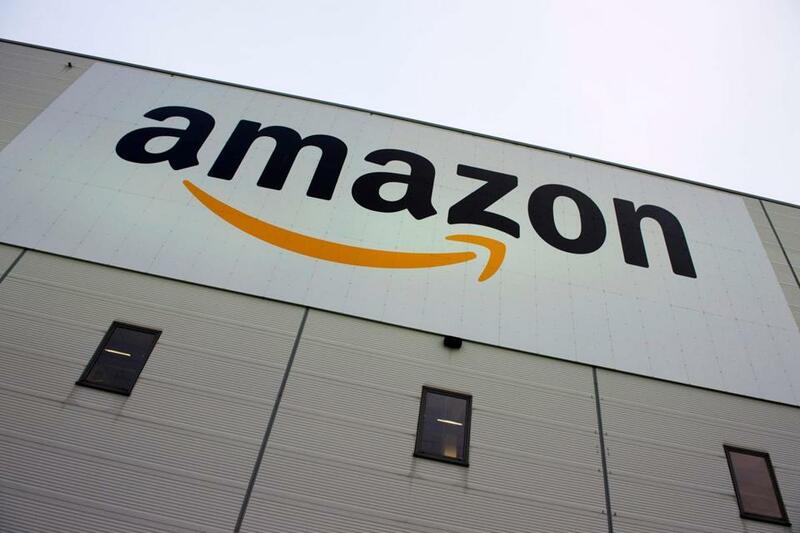 ■ Ken Fiola, executive vice president of the Fall River Office of Economic Development, told the Herald News the proposal will center around a 90-acre technology park, near where Amazon already has a distribution center. Additional space would be available about a half-mile away in the Riverfront Business Park in neighboring Freetown. ■ Officials in this town told The Sun Chronicle newspaper that they are considering making a pitch to Amazon. There are about 200 acres of available land — parking lots owned by the Kraft Group — across the street from Gillette Stadium and Patriot Place that has been eyed for development in the past. ■ Town Manager William Keegan told the publication that the site along Route 1 offers upgraded utilities and easy access to key highways. The MBTA also plans to soon launch a pilot program to have commuter rail trains pick up and drop off passengers next to the stadium. ■ This small, former factory city is considering a bid that would include a 100-acre plot of land originally viewed as a potential site for a casino near where Route 2 and Interstate 190 converge, according to the Sentinel & Enterprise newspaper. ■ City officials told the publication they plan to cite low cost of living, a speedy permitting process, and proximity to Boston, Worcester, and Manchester, N.H.
■ The Riverview Technology Park that straddles Billerica and Tewksbury is a centerpiece of this multicommunity bid. ■ Neighboring Lowell is a partner in this bid. Its offerings include the University of Massachusetts Lowell and Middlesex Community College. Amazon has said it wants its second headquarters to be near a strong university system. ■ James M. Cowdell, executive director of Economic Development & Industrial Corp., the city of Lynn’s development bank, told The Daily Item newspaper of Lynn that the agency is working with several property owners to come up with potential locations and plans to bid on the city’s behalf. “We’re going to roll out the red carpet,” he said. ■ Lynn Councilor Peter Capano told the publication that there may be viable sites along the Lynnway, a section of Route 1A that cuts through the city. ■ The North Shore community is only about 10 miles from downtown Boston, and state officials have looked in recent years for ways to try to revitalize its waterfront. ■ Haverhill, Lawrence, and North Andover are coming together on a regional bid centered around Osgood Landing, a 168-acre parcel along the Merrimack River that was the former AT&T/Lucent Technologies manufacturing complex. ■ Officials have talked up the property as having proximity to Boston (within 30 miles), being close to two international airports (Logan and Manchester in New Hampshire), and being near commuter rail stations. ■ In case Amazon needs more space than Osgood Landing can offer, Lawrence has a few other sites nearby with easy highway access — a former Showcase Cinemas property and a 14-acre city-owned lot. And Haverhill has a waterfront parcel that could be in the mix. ■ Methuen and Andover are also partnering to offer potential satellite locations for this bid, according to The Eagle-Tribune. For more info, click here, here, and here. ■ City officials here plan to offer to Amazon a 300-acre, city-owned Whaling City Golf Course, slated for redevelopment. ■ This economically struggling mill city does not offer much public transit (no commuter rail), and it’s hardly known as a tech center. Still, that’s not stopping Mayor Jonathan Mitchell from pitching the virtues of being in New Bedford — no traffic, no housing crunch. “There is no city in America that will have all of Amazon’s boxes checked,” he said. ■ Nine western Massachusetts communities, including Springfield, are developing a potential bid. The other eight are: Agawam, Chicopee, Easthampton, Greenfield, Holyoke, Northampton, Westfield, and West Springfield. ■ Springfield has lagged economically for decades due to the loss of its once-booming manufacturing sector, but there has been progress of late, including construction of a $950 million casino-hotel project. ■ Springfield Mayor Domenic Sarno told the Globe he is eager to see how the region could work together. “If you don’t dip in your toe in the water, you are never going to know,” he said. ■ Mayor Thomas Hoye Jr. recently said he’s pitched for Amazon to build at the 147-acre site of the Silver City Galleria mall, according to the Taunton Daily Gazette. Several major retailers have left the mall in the past few years and Hoye wants to try to revitalize or reinvent the area. ■ Taunton is one of about two dozen communities in Massachusetts defined by state officials as a “gateway city” in part because of below-average income and educational attainment rates. ■ Union Point, formerly known as Naval Air Station South Weymouth, actually straddles Abington, Rockland, and Weymouth. ■ The 1,500-acre site, which has had its share of fits and starts and change in ownership, might finally be ready for prime time under developer LStar Ventures. ■ Worcester can’t meet all of Amazon’s needs but has a few downtown sites in mind that could supplement a proposal, including the Gateway Park project area, which is anchored by Worcester Polytechnic Institute and has redeveloped from brownfields into mixed-use space, including for academic and research purposes. ■ Tech in Worcester? Yes. In March, a report by TechNet and the Progressive Policy Institute ranked Worcester eighth among the top 25 emerging startup hubs in the United States. ■ Newton mayor and Democratic candidate for governor Setti Warren has said that he supports a Worcester bid over others in Massachusetts, arguing it would do the most to ease economic inequality in the state. Key to Warren’s plan is a long-discussed — but not yet formally-studied — high-speed train from Springfield to Boston. ■ This bid features several communities: Bridgeport, Fairfield, New Haven, and Stratford, places with pockets of poverty and prosperity. “We’re taking a regional approach,” Thomas F. Gill, director of planning and economic development in Bridgeport, told the Hartford Courant. ■ Selling points include access to the Metro-North commuter rail and area colleges, including Yale and Sacred Heart universities. ■ This was one of 17 proposals from local communities in Connecticut that went before a state-level agency in recent weeks. The agency has picked two proposals to pitch as bids to Amazon: one from the Hartford area and another from the Stamford area. (More on those two bids below.) But proposals not chosen by the state might still bid directly to Amazon, and some including Bridgeport-area officials have said they plan to do so, according to the Courant. ■ Danbury plans to make a direct pitch to Amazon, according to the Hartford Courant, despite the state’s decision to throw its weight behind other proposals. ■ The Danbury area boasts one of the strongest economies in the state, according to a recent report in The News-Times of Danbury. Officials there plan to cite the city’s economic and job growth and efficient permitting process as part of their bid. ■ Danbury Mayor Mark Boughton posted a video message to Amazon on social media that tries to make the case for the city. ■ This suburban town has proposed multiple potential sites, including the Enfield Square Mall and a nearby industrial park, the Hartford Courant reported. Its proposal is not one of those that will receive state backing. ■ The town’s offerings include easy access to Interstate 91, proximity to Bradley International Airport, and a passenger rail station expected to open in town in a few years. ■ This bid is a joint pitch from both Hartford and neighboring East Hartford. It is one of two bids from Connecticut that has the state’s backing. ■ This pitch will also include officials from Bethel, Ridgefield, and Weston, the Courant reported. It is one of two bids from Connecticut that has the state’s backing. ■ Stamford officials have said selling points include access to nearby airports, development growth around the Metro-North commuter rail, its proximity to New York City, and a strong digital media presence among local businesses, according to the Hartford Courant. ■ Stamford ranked second-highest in a 2016 state index of Connecticut communities’ economic health, according to The Advocate newspaper of Stamford. ■ Governor Chris Sununu has told the Concord Monitor the state is planning an aggressive bid. ■ This city, along with neighboring Central Falls, has publicly pitched that Amazon build in a 160-acre area that straddles both communities and where a commuter rail station and transit hub is scheduled to open in 2020, according to the Providence Journal and press releases from the two cities. ■ The sales pitch includes their proximity to Boston, New York City, and Washington as well as to top colleges in Rhode Island and Massachusetts. It also touts that region’s affordability compared to Boston. ■ State officials, meanwhile, have asked communities across Rhode Island to submit proposals to the state which then hopes to submit a unified proposal before the deadline. The state’s Commerce Secretary Stefan Pryor said in a statement to the Globe his office has received ideas and information from communities in addition to Central Falls and Pawtucket, but the statement did not say how many, or which cities and towns have made pitches. What about Maine and Vermont? The list above doesn’t include any communities in two New England states: Vermont and Maine. Doug Ray, a spokesman for the Maine Department of Economic & Community Development, declined to say directly whether Maine plans to submit a state-backed bid, but in a statement he suggested it did not intend to do so. “Amazon is seeking a new home in a ‘stable and business-friendly environment,’ ” Ray wrote. Tim Logan, Jon Chesto, and Janelle Nanos of the Globe staff and Globe columnist Shirley Leung contributed to this report. Matt Rocheleau can be reached at matthew.rocheleau@globe.com. Follow him on Twitter @mrochele.